National Caster Corporation sells chair casters for new and replacement applications. Chair casters can be purchased for all floor types including hardwood, laminate, carpet, and carpet mats. National designs and builds all styles of replacement chair casters, rollers, and wheels. 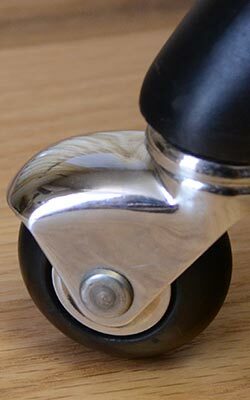 Replacement chair casters are available in a wide variety of styles (twin wheel, single wheels, ball caster, etc) and finishes (black, brass, chrome, etc). Different treads are available for specific floor types, so the casters works perfectly on the floor you have.